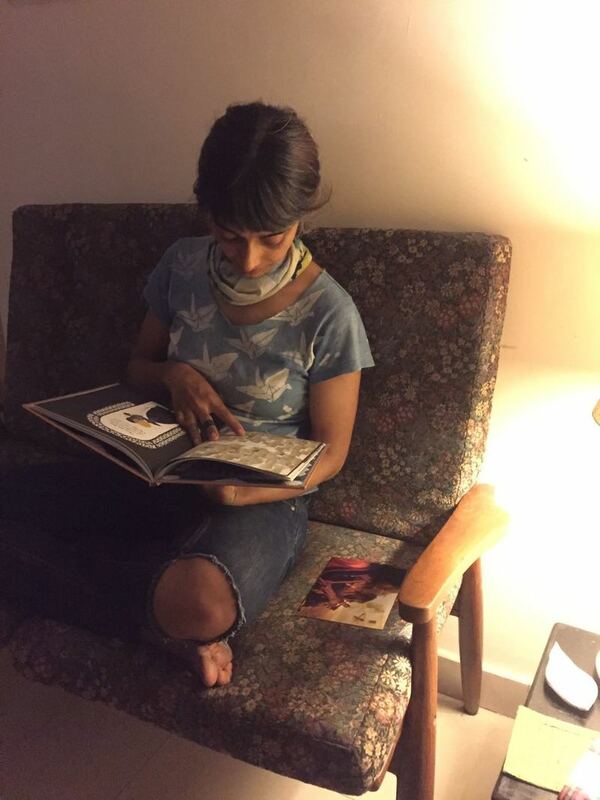 Anjora Noronha was one of the Illustrator Gurus for our #6FrameStoryChallenge in 2015, and we're delighted that she is illustrating a book for Pratham Books this year. Written by Sheila Dhir, this story is about the moving friendship between a goby fish and a pistol shrimp who live deep in the ocean. Read a short interview with Anjora, in which she gives us a peek into into her illustration process. What mediums do you most enjoy working with? How do you choose a particular medium for a story? 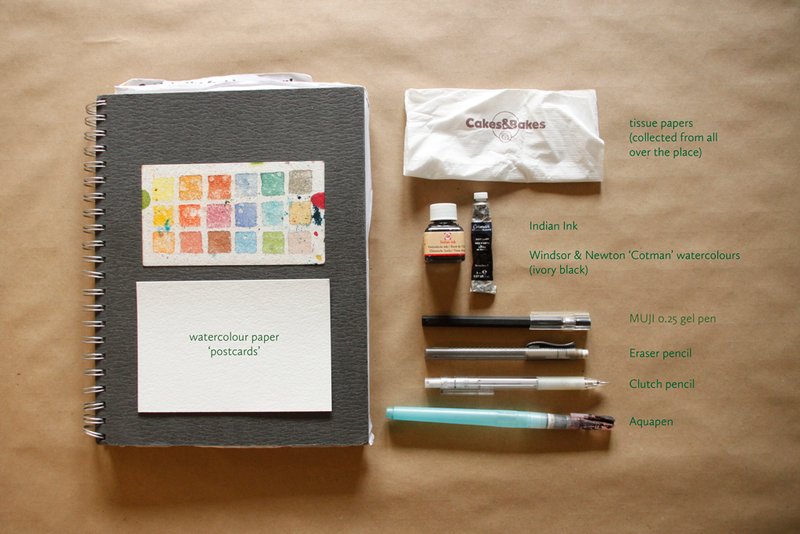 For personal projects, my drawing kit contains a sketchbook, watercolour postcards, a tiny bottle of Indian ink, a tiny tube of watercolour in ivory black, a mechanical pencil, a 'pencil' eraser, an aquapen, a MUJI gel pen (LOVE) and lots of tissues collected from all over the place. Other than that, I don't have a particular style or medium that I work with, so the start of a new project is always a mix of excitement and nervousness at discovering which medium is going to be the medium of choice. I somehow never know, and so each time I start, I have to go through sheets and sheets of paper and material, looking for what 'feels right'. 'What feels right' includes: how much texture I can achieve; if the essence of the medium suits the essence of the story (this is naturally highly subjective); and also very simply - if it excites me. What kind of stories do you enjoy working on the most? For children's books I prefer working on books that have a strong environmental theme. For adults I prefer working on stories about people and cultures. 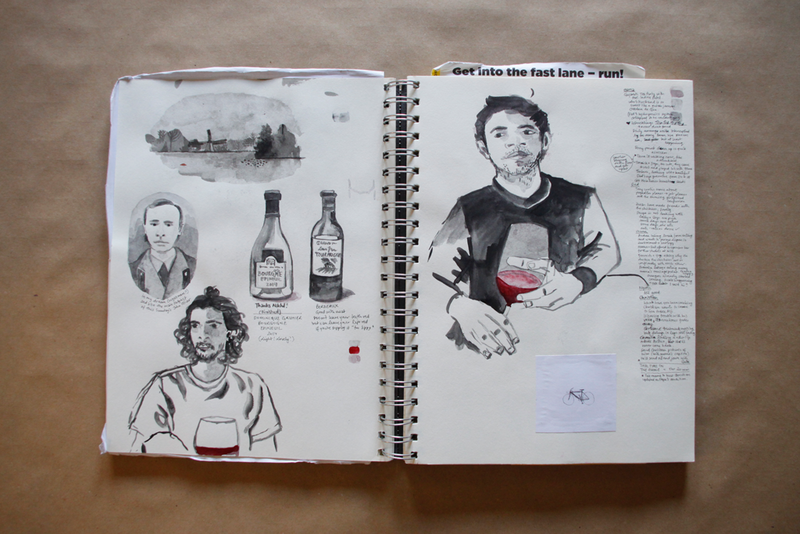 My favourite thing to draw is portraits of people I meet when I travel. Which part of your work do you enjoy the most, and which part do you enjoy the least? The most enjoyable part is when all the frames and page sketches have been approved and finalized, and it's time to colour them in. That is the most charming part of any project for me: I put on music, or a podcast, and spend hours glued to my desk in creative solitude. Most details have been decided by this stage, at this point it is a matter of turning off the thinking side of my brain and allowing things to happen on their own. I sleep at night excited about the next day of drawing. Even though I find it more challenging, I also love the character development stage because either I act out expressions and postures, or I ask someone to act them out for me. What I enjoy the least is scanning and cleaning the final artworks and preparing them for print. Following that, there's always the big existential angst about which font to chose, and at what size, with very few helpful cues from the universe. 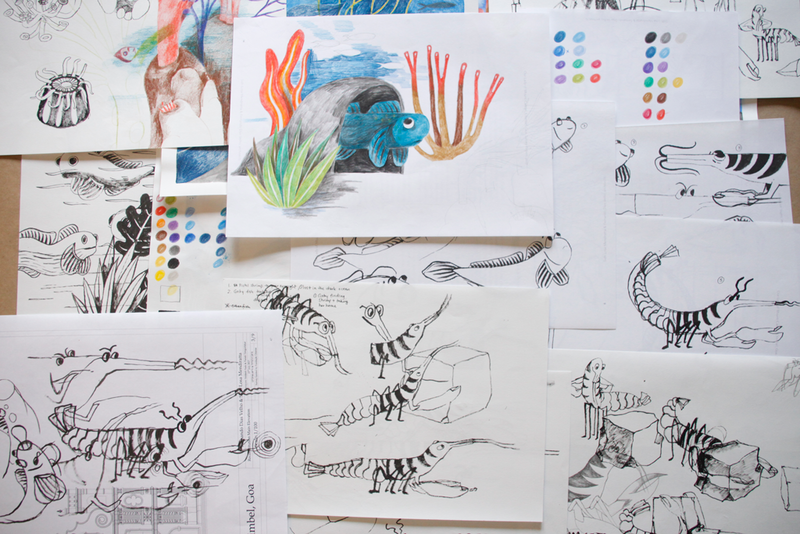 This year, you’re illustrating a book for us on the symbiotic relationship between a goby fish and a pistol shrimp. We loved all the character sketches you made for this. What kind of preparation goes into illustrating a book for children? Ideally, the initial stage would involve doing studies of the characters from life, but since I didn't have access to the two main characters in the story I'm currently working on, I watched as many YouTube videos and read as many articles as I could. Then I filled many pages with drawing after drawing of the characters, repeating them over and over again. My aim was to get to know these two so that I could intuitively draw them in any situation. This was followed by a style and colour test, which is the phase where I try to discover which medium I will be working in. For this book, it is colour pencil, which is a medium I have never worked in before. I tweaked my colour palette multiple times and drew one page over and over again, changing individual details with every attempt to discover what textures and effects I could achieve with them. I have stopped using sites like Pinterest to find inspiration. Who are some of the illustrators whose work you follow closely? For children's books: Carson Ellis and Júlia Sardå Portabella. http://www.carsonellis.comhttp://www.carsonellis.com has a Q&A section on her website, and one of the things she speaks about is her limited gouache colour palette, and how - when she added a colour to it - it was quite ground-breaking for her. Júlia Sardå Portabella seems to work mostly digitally, so I turn to her work for clues on how to work digitally - a new medium for me. Recently I discovered the work of Joann Sfar, and have bought every book of his that I can get my hands on. The colourful and surprising artwork of Brecht Evens. One of my favourite young, contemporary artists is this guy called Ward Zwart, who puts up a lot of his work online, but is very mysterious otherwise. (He did reply directly to a message I left him on Instagram though :) Stephanie K. Birdsong, mostly known as shoulda-woulda-coulda: for her daily and very quirky warm up paintings in her Planner. Oh, to be so productive on a daily basis! And of course, the work of my peers in India, some of whom I know personally, and whose creative journeys I have been following for a while now. Anjora Noronha grew up in Vienna, moved back home to Goa, studied at the Srishti School of Art and Design in Bangalore, worked in Delhi, and then studied more at the University of Barcelona. She currently lives between the Indian tropics and a windy little town somewhere in northern Europe, where she works as an illustrator on a variety of projects ranging from comics, children’s books, and historical books of places long forgotten.